"The Popper Polonaise de Concert is a great recital piece of moderate difficulty." David Popper, born June 18, 1843 in Prague, Czech Republic, was a prolific composer of music for his instrument, an eminent performer, and a prominent teacher. Popper composed more than one hundred works for the cello, including four cello concertos, numerous salon pieces for cello and piano, and a number of etudes. Popper’s most invaluable contribution to the art of cello playing is his High School of Cello Playing, Op. 73, consisting of forty etudes. These etudes are an integral part of every cellist's technical foundation. The Grove Dictionary of Music and Musicians once described Popper thus: "His tone is large and full of sentiment; his execution highly finished; and his style classical." He died August 7, 1913 in Baden, Austria. In the Polonaise de Concert, Op. 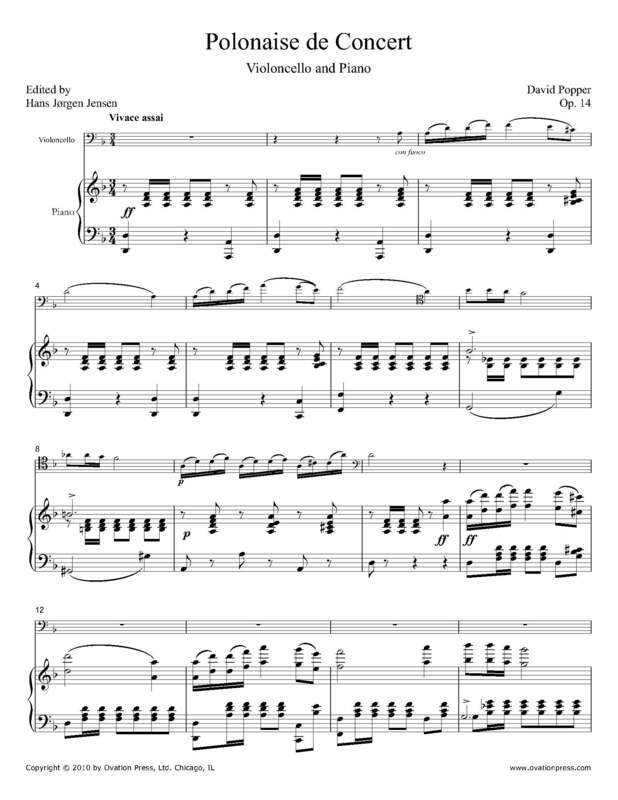 14 the piano introduces the typical polonaise rhythm which is then taken over by the cello in its opening theme. The second theme is a beautiful melody full of expression and romantic sentiment. In the third section Popper opens his bag of virtuosic tricks and employs everything from double stops to fast arpeggios to an ending full of octave passages. This work is a great piece to learn and perform before attempting the more virtuosic Popper works like Dance of the Elves, Spinning Song, and Vito.